I'm fairly inexperienced at carpentry work, and have minimal tools. Two years ago, a hurricane knocked down part of the roof of my mostly unused shed. I'm looking to tear down the shed and rebuild / replace. The whole shed probably needs to come down as the wood is quite rotten. Any suggestions or recommendations to consider before beginning this ridiculously fun project? Just how much experience and tools do you have? Do you have a way of getting materials from the home improvement store / lumber yard? Do you have someone that can give you a hand? Where are you / the shed? I don’t have any carpentry skills but would be willing to lend a hand if you’re close to me. Experience with wood... Not much. I've replaced moulding, built a table from reclaimed hardwood flooring, and done some minor cabinet repair. I have friends who will probably trade labor for beer and food. Tools nothing much, a mitre and skillsaw, clamps from the table, drills. I've borrowed tools before, including a table saw for the table. I have a Honda CR-V for transport, so not exactly easy to transfer major stuff, but can handle 10ft 2x4s or drywall sheets or similar. Do you need an actual shed or could you store the few items that used to be in the old shed inside your garage/basement? You could design storage shelves/tool boxes/etc. for those needs and find those kind of projects easily within your stated abilities. If you do decide you need a shed, you might be able to get a kit for a reasonable amount. This would allow you to stretch your woodworking skills without overwhelming yourself. My Dad, back in the 70's, bought a tin shed kit (likely from Sears, back when Sears had decent stuff) where we stored the lawn mower, snow blower, our bikes, outdoor toys, etc. With a little reinforcement, it lasted for decades. He was an electrician by trade who could do basic mechanical and plumbing work as well but not a lot of carpentry. Over the years from the time he put the shed up, he developed more woodworking skills. This allowed him to replace the tin shed with a two story "barn" which allowed him to pull up the well pump in any kind of weather which was under the shed as well as gave him more storage room. Take the time to plan it out for current and future needs as best you can. You'll want to take into account how sturdy to make it given hurricanes come your way and how to protect from bugs and rot. Consider the pros and cons of putting it on a concrete pad versus piers. I did a quick Google on "this old house shed plans" and they have lots of good info. This link for instance https://www.thisoldhouse.com/how-to/how-to-build-garden-tools-shed may work to get you just enough shed to meet your needs. They claim you can make it for around $150 if you use pressure treated wood and that it'll take about 8 hours for someone with moderate skills. I find This Old House tends to explain things well but others here might have additional suggestions for where you can get good, easy-to-follow plans if you don't want to/can't afford a kit in your area. Be aware that your home made shed will likely cost more than buying a pre-built one. 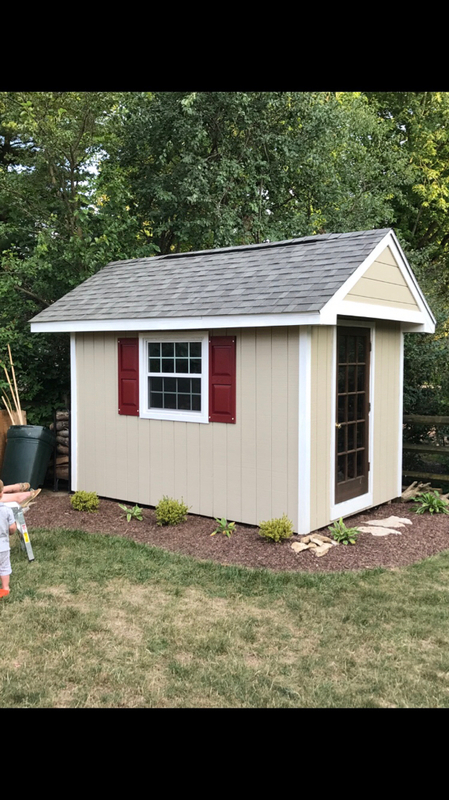 My 8x12 shed ended up costing about $2k in materials. It's probably higher quality than a pre-built one, and it was an interesting project, but not a money saving one. You don't need a lot of tools. The only saw I used was a circular saw, with a speed square for cutting 2x4s and a straight edge for cutting sheet goods. Your miter saw will be handy. A hammer and an impact driver should cover all your fastening needs. Tape measure, level, chalk line, etc. Here's the shed I built. Done nearly 100% working alone, but I had help raising the second two walls after nearly injuring myself doing the first two alone. I built temporary wooden scaffolding attached to the shed to finish the roof. I really need to finish putting the trim up on those last two corners sometime. I meant to do that this past summer, but birds had built a nest in the soffit and it seemed impolite to seal them in. Anomalous - that is beyond fantastic. Thanks so much for the info. I think the best start to take a look at Shed Rebuild on Youtube, there are tons of tutorial videos out there. I spent about 1200 on an 8x12 shed, materials only and I salvaged some materials like doors and windows. Took a weekend to build (me and a couple of guys for 1 day and myself the rest) and a lot more time after to finish it with fascia, soffit, paint, shutters, trim, etc. I could have bought, delivered, and had installed a prebuilt for around 1300-1400. You won’t save any money on DIY, but you will get a better build designed the way you want it.